Batchelors Way: Rustic charm Bedroom - Light it Up!! Rustic charm Bedroom - Light it Up!! Now that the walls were done it was time to look up!! 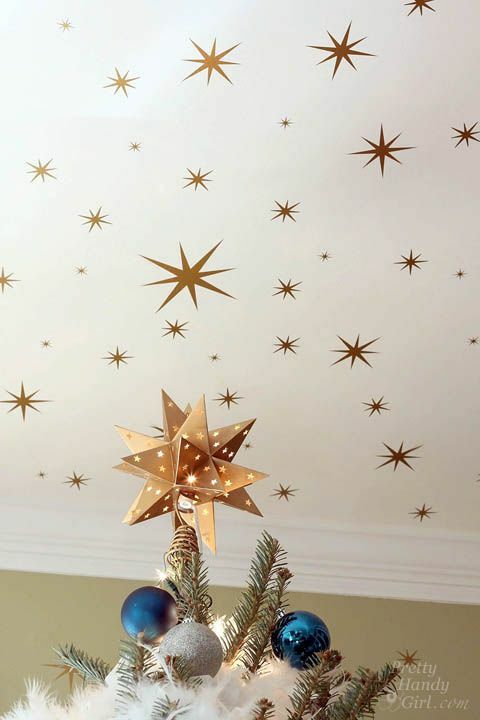 I wanted to put gold stars all over the ceiling like these at Pretty Handy Girl! But Ashlee didn't like this. It is Ashlee's room so, I went back to the drawing board. Ashlee wanted me to do her ceiling just like I did Emilee's only in different colors. You can go check out Emilee's Glamorous Room on a Budget Reveal. so a carbon copy just wasn't in the cards. and looked through my stash of stuff and came up with a plan!! Before I show you, lets just see what we started with! 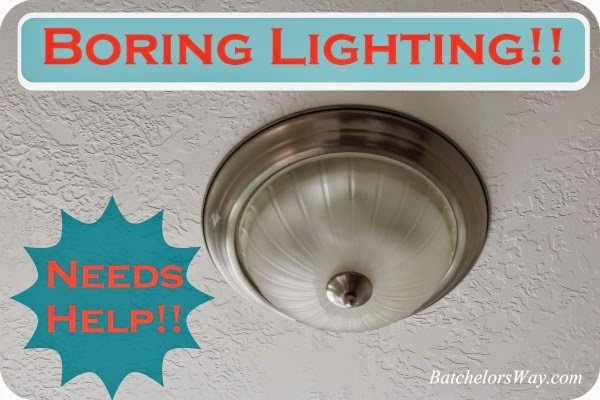 This was a plain white ceiling with a boring builder grade light fixture right in the middle. No real character to speak of. First, I took down that light. I wanted to frame the new light fixture some how but I really wanted to use curves. 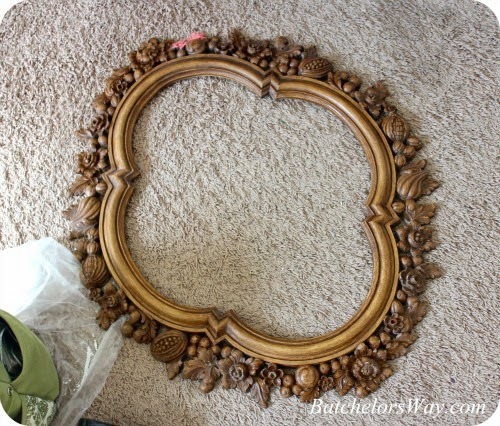 Enter my awesome faux wood frame!! just something I picked up at a second hand store one time for $4. I have tried to use this a couple of times before, but it just wasn't right. But this time it was so right!!! I have also wanted to try chalk paint and this was the project. I found lots of recipes on line and I loosely followed them. For paint, I used the leftover free paint I got at the dump once. I also used that paint on the laundry room door. Once it dried I sanded it to distress it up a bit. Then I started putting a brown glaze on it. Painted over the glazed part, re-sanded and then added a white glaze!!! Here is a close up before and after!! I added some wallpaper to the inside of the frame and nailed the whole thing to the ceiling! Next, the light fixture itself. In the summer the girls rooms get a little warm so I gave each of them the option of a ceiling fan. They both said no to the fan and yes to a chandelier. I already had a light for her room, I bought it long ago and put it in our entry way. It was too small so I eventually replaced it, and it's just been laying around ever since. I originally painted it a golden tan color. 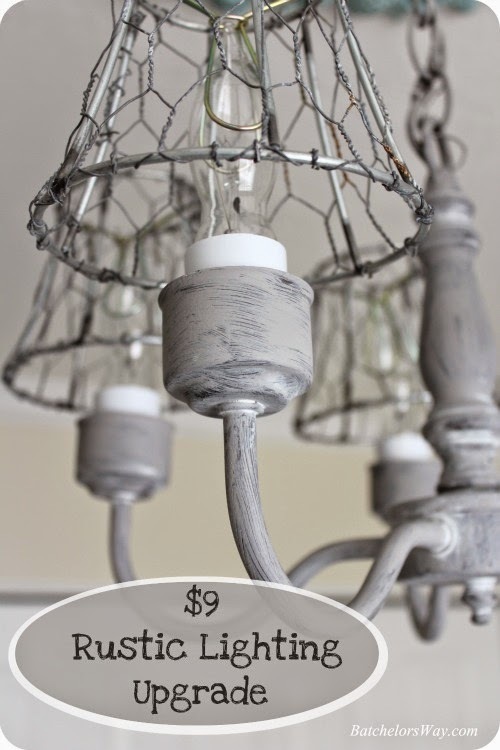 After looking on-line Ashlee picked out lots of rustic wood fixtures, so that is the look I tried to create. 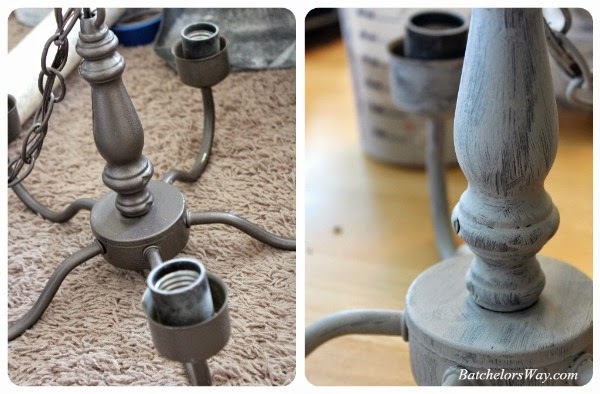 I was really liking the chalk paint thing, so I mixed up some more using leftover grey paint from Emilee's room. I painted on just one coat with a sponge brush. This left some of the original color peeking through the brush strokes. I really liked the effect and it was super easy!! To finish it off I added a white glaze, I will show you how that looks in just a minute!! First I want to talk about the shades. This baby didn't come with shades, but really needed them to add balance to the fixture. And I didn't want anything to take a way from the feel of the rustic base, or impede the amount of light being given off. One unique thing about my light was it had regular sized light bulb bases. OK, what's the problem you ask? Most chandelier shades clip on small candle shaped bulbs. As I took a day or two trying to figure out how to convert my lampshade clips, I happened to run to the store on other errands and I just happened to see if I could find any type of bulb that would work!. I found that a regular bulb and a candle bulb had gotten married and had a baby!!! You can buy small candle shaped bulbs with regular bases!! Once I solved that problem I just needed to strip my shades. I had these shades I bought at a garage sale once, they use to live on my chandy over the stairs, but were now taking up space in a drawer. I started by cutting and ripping all the fabric off them. S now I had a wire skeleton frame. Now for the chicken wire!! You heard me right, I said chicken wire!! I thought that would go well and let all the light through! A neighbor with a chicken coop had a roll laying around and gladly cut me off a small section. I offered to pay him, but he declined saying he was just being neighborly! I love neighbors, I still need to get some cookies over to him. 2. Start at the bottom/largest end. 3. Use needle nose pliers to wrap the wire. 4. Use wire to connect the side seam. 5. Cut off the excess at the top only after you have the bottom attached. 6. 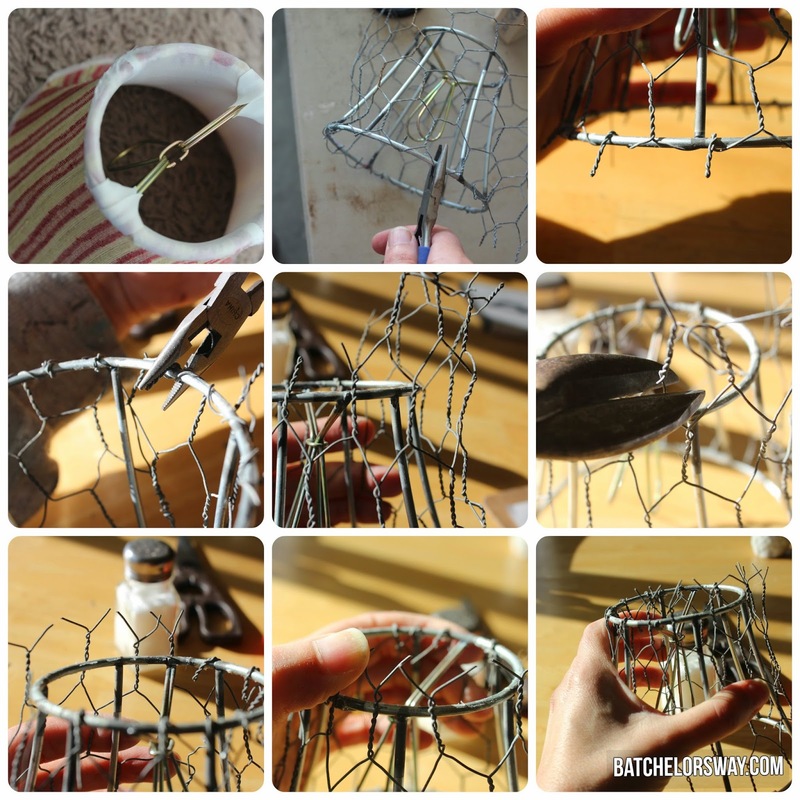 Use tin snips to cut the chicken wire easily. 7. After you start attaching the top, press firmly with your hand to form the wire to the base form. I hope that all makes sense. I painted my first one black, but didn't like it in this room. So I just left them as is!! So what do you think of it all together? If you look closely you can see the white glaze on the body of the fixture. I really liked how it turned out. Now that's much better than a boring light!!! I made some chicken wire shades a year or two ago, they have held up really well, and the dust doesn't show which is a bonus. Good evening. I really enjoy your blog. However, I did not like at all your idea of chicken wire lampshades...until I saw the finished product. Love it! I wish I was half as talented as you. Great job. Hi, Ronda! 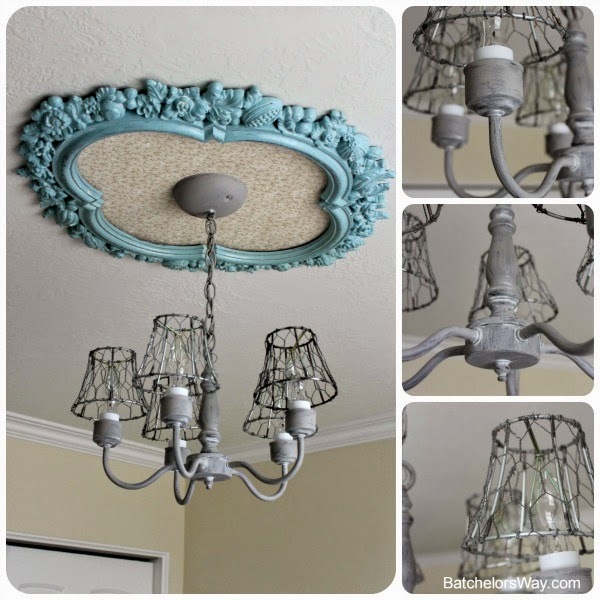 I adore your chandy idea! The frame on the ceiling is absolutely brilliant. And I am def trying the chicken wire trick, it is so rustic and charming. Thanks for the great ideas! Hi, I love this idea. I'm actually doing something very similar. Any tips for nailing up the picture frame? My picture frame is plastic, so I'm afraid it could crack. How did u attach your frame to the ceiling?